When it comes to pitching, personalization comes in two parts. First, while it may save time to list all your contacts in bcc and send one email, journalists find mass email blasts to be impersonal and often delete such emails without even looking at them. Avoid the bcc line and you'll avoid the spam folder. Second, make sure you use the name of the contact you are trying to reach. A vague "To whom it may concern" or (heaven forbid) the wrong name tells a contact that you haven't put in the time or effort to get to know who you're emailing. Let them know that you care by taking the time to personalize your email. A great pitch doesn't work so well if it's never opened, which makes your subject line the most important part of your email. Some journalists will ask for specific formats or information like "PRESS RELEASE" in the subject line, but most are happy with a punchy, informative headline. Offer them a reason to open your pitch or tease some information that will have them asking for more. You want to establish your credentials as soon as possible so that whoever opens your pitch knows you mean business. The best way to do that is to leverage your founder's or customer's stories. Add a line about your founder's previous achievements or one about how much your customers love your product. This boosts your credibility, as well as providing another talking point to your contact. A pitch is just your opening line, so don't try to overwhelm them with your fantastic messages all at once. Keep your pitch as short and simple as possible, but don't leave too much out! A great way to do this is with bullet points. Not only is it visually appealing, a bulleted list condenses all of your talking points without feeling long-winded. Unless you are pitching for a straight review, you'll have to tie your company news into a more general trend. While every CEO's dream is to have a feature length article all about your company and product, journalists are always looking for a "why" for their stories. Take control of your angle by giving them a "why" in your pitch, whether it's discussing a trend or referencing the journalist's past coverage. That way you can shoot for the moon-sized company feature, and even if you miss you'll land in the stars of a industry-focused article. Besides, having your name included in an article about your industry shows your audience that you are prominent in your field. Once you've caught their attention with references to trends and a list of all of your best features, it's time to woo writers with additional offers. Offering a demo, adding a link to a media kit or pasting a press release into your pitch adds value by giving a contact something they can look at and potentially use right away. Visuals, like a video, are even better. Life is fast-paced nowadays, and some contacts might be interested but not have the time for an extended email exchange. Cut to the chase by showing them how you can be an asset. Pitching is all about opening lines of communication, so be clear about what you expect from your contact. 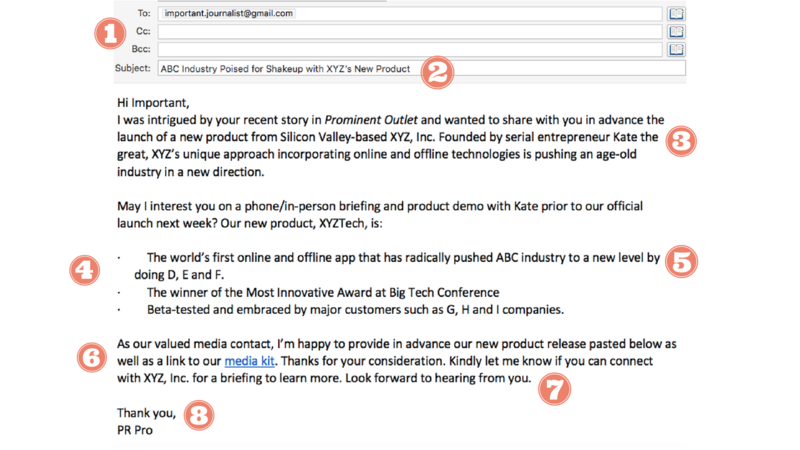 Finish your pitch with an unambiguous call-to-action. Let them know that you are able to connect them to a source or politely ask for coverage consideration. You'll never know what people are willing to do unless you ask. Even a simple "Look forward to hearing from you," can prompt the idea that a response is expected. It never hurts to be polite. If your contact has reached the bottom of your email pitch, they've picked your pitch out of the hundreds in their inbox. Thank them for their time and for the start of a new relationship. Crafting the perfect pitch takes time and effort, but once you understand the basics, you're well on your way to PR success. To talk to SKC about crafting the perfect pitch, click the button below to schedule a complimentary consultation.